Well, it looks like it was a bust. 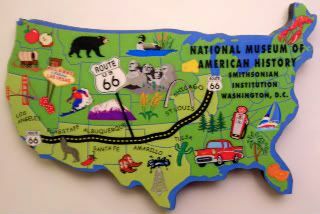 As I mentioned yesterday, some friends and I were planning a Great American Roadtrip, and were planning to moblog it from the road. We ended up cancelling the trip, for many reasons, chief among them - gas prices, and me buying into the media's recession coverage. GAR was the reason I started this blog. I worried that I'd end up getting repeat magnets, which lead to thinking I needed a magnet list, which lead me to joy magnetism. So it's only fair that this blog gets to take a little roadtrip of its own. Today's itinerary was two of us flying down from NY to NC to pick up the car and the other two folks in our party. Then shopping for provisions, packing the car, and of course, getting no sleep tonight, and still leaving at 4 in the morning. Yes, we were planning on staying good friends throughout the trip. Awww, that was today?? Well if we look on the brightside, with today’s rain your flight would have been cancelled or seriously delayed. *flings glitter* Oh and Route 66 isn't all that it's cracked up to be.